How to Make a Newborn Survival Kit for a Baby Shower Gift! - So Festive! Looking for a simple & creative baby shower gift? These cute and practical Newborn Survival Kits are simple and inexpensive to put together with printable tags and tons of gift ideas to make the newborn stage a bit more survivable for new moms and dads. But, if you want to give something to help mom and dad with the transition to parenthood, these newborn survival kits are perfect! I received a hospital survival kit before I had my first baby and it was so fun to receive some things I never would have thought to get. Now that I’ve had 4 babies, I’ve curated a list of items to make the entire newborn phase a little bit more survivable– because let’s be honest. Isn’t it all about survival those first few weeks when you’re sleep deprived and exhausted? It was for me! And your friend is no different! Make their day with a baby shower gift just for them! To make a newborn survival kit for new parents, you’ll want to put together a basket of items that will be ever so helpful for them during the newborn stage. Anyone who has been through this stage knows that while the newborn stage is so wonderful, it is exhausting, both emotionally and physically. That’s why gifting a newborn survival kit will be so appreciated! Mom’s kit should include gifts that will help her survive the postpartum stage…and that entails essentials for her! Ideas include: a water bottle to help with the never-ending thirst, nursing cream (because no one tells you it hurts! ), face wipes (because she won’t have time for long face washes), and a notebook to jot down precious first memories. You can get a shopping list and tags for 20 ideas for mom here. For dad’s gift basket, include items that will help him help his wife! Sometimes guys are willing to help, but don’t exactly know how. So this basket should be filled with things that will make it easier for him to know how to jump in and help! Give dad essentials he needs like: hand sanitizer to make sure everyone keeps those germs away from the baby, snacks to much on when he’s hungry (so he doesn’t need to bother his wife), a gift card to purchase any last minute baby or wife essentials, and a Dad’s Root Beer to congratulate him on becoming a dad, to just name a few. The complete shopping list and gift tags for Dad are in the Newborn Survival Kit tag bundle here. Once you’ve gathered all your survival kit items, print and cut out these Newborn Survival Kit tags and attach to each item. Each tag has a description of how that item will help them out! Put all the gifts for new moms and dads into a large basket or bag–one for each mom and dad. You can wrap each item separately or just put them all together in a basket. You can get the printable tags right here for just a few dollars. Buy once and use over and over for all any baby shower you need a gift for. If you don’t like the gifts or colors, you’ll also get an editable file to change! 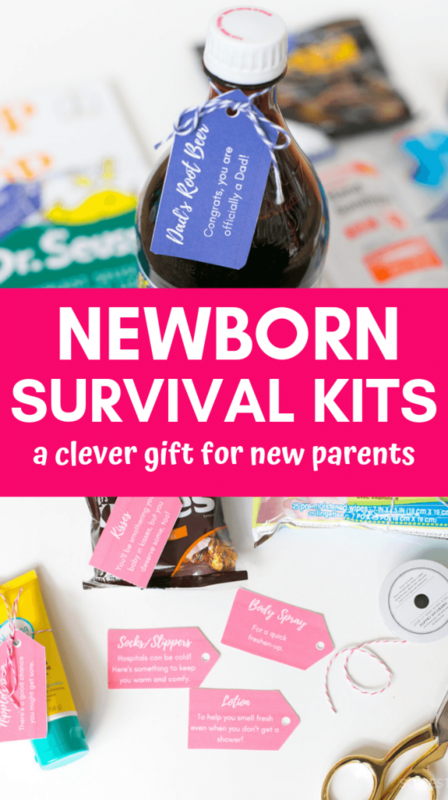 Ready to create your own Newborn Survival Kit for Mom & Dad? After having 4 babies, we’ve found what we’ve loved and haven’t. You can see our list of favorite baby items we’ve used over and over if you need some more inspiration! See our Baby Favorites List Here. Now you have a simple Baby Shower gift idea– a Newborn Survival Kit!